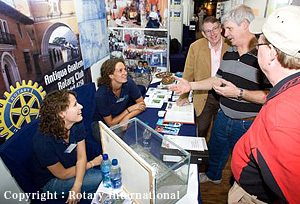 Rotary Club is an assembly of people selected from various businesses and professions in a given locality. The Club encourages these people to achieve higher standards of life and work through friendly interchange and to pursue the “ideal of service” given to each other and to society. Rotarians can also develop friendships abroad and pursue these ideals in a broader arena. Beginning with one club in Chicago (U.S.A.) in 1905, the Rotary drive soon picked up momentum, evolving into Rotary International by 1922. Today there are some 34,000 clubs in more than 200 countries/regions, with total membership exceeding 1.2 million. 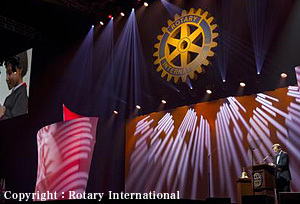 The name “Rotary” sprang from the custom of holding meetings in rotation in members’ offices. The 848th Rotary Club to be chartered in Japan, the Tokyo-Shinagawa Chuo came into being in 1968. Currently with about 50 members, the Club is located in the Shinagawa region of Tokyo—popularly known as Japan’s new gateway to the world. The place has easy access to Haneda Airport, is a main stop on the bullet-train service, and will be the departure point of an even faster Linear Motor Car (now in planning). The Tokyo-Shinagawa Chuo is noted for its wide-ranging welfare activities—a result of freewheeling talk among members who give due respect to tradition and established rules as well. The Club belongs in Tokyo-Yokohama Group, one of nine groups comprising Rotary International District 2750. This is the only district in Japan which exercises control over a non-Japanese territory: Saipan, Guam and other islands in Pacific Basin Group. ① Is it the Truth? ② Is it Fair to all? ③ Will it build Goodwill and Friendship? ④ Will it be Beneficial to all? Activities undertaken in support of the Club itself, including augmentation of membership. Service programs designed to promote vocational awareness of members. Programs directed toward local communities. Service category that encompasses all regions of the world. Programs designed to promote healthy development of younger generations. Committees are established to manage and energize each of these service categories. “Club Service” has an important role to play—for ensuring smooth running of all Club activities and promoting harmonious relations among members. We, at Tokyo-Shinagawa Chuo Rotary Club, have set ourselves a code of conduct that helps make our programs relevant and effective. ONE: We keep firmly to our Club concept in all areas of work. TWO: We get in action immediately whenever the need occurs. THREE: We see every program through to its successful end. We members take pride in strict adherence to these guiding principles. 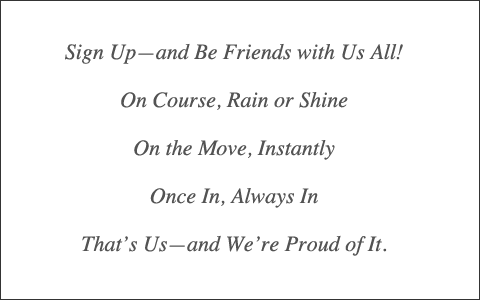 You will be bosom friends with us all from Day One! 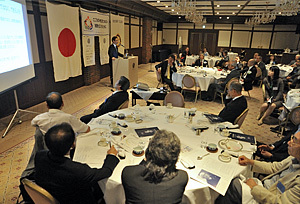 記載情報、写真などの無断による転載、使用を禁じます。Copyright © 2012 Tokyo Shinagawa Chuo Rotary Club.